The green smoothie revolution doesn't appear to be waning so rather than drink something that doesn't work for you flavour wise, try adopting these Tenina rules! I am dead set against drinking grass clippings, no matter how brilliant they are supposed to be for my health! I know there are undisputed benefits to drinking green smoothies, with loads of anecdotal evidence out there as well as some legit scientific evidence to back up a good reason or three to drink them frequently. I have to say that a lot of green smoothie recipes out there are loaded with calories, so if that matters to you, you should really think about it before having a green smoothie as part of your breakfast. To be fair, it should be a meal in and of itself. Think about the liquid as being part of the flavour. Don't just settle for water. Think coconut water, coconut milk, other nut milks, almond milk when it's home made is one of my absolute faves. Using a nut milk will also give you a protein boost without adding anything powdered. You could also use brewed coffee of chocolate if you are not too worried about the end colour being bright green. Think lettuce. Yep, how much water is in lettuce?? LOADS. Then of course all the usual suspects, spinach, kale, celery, broccoli, chard, Italian parsley, bok choy or other Chinese greens, rocket, cucumber. I prefer to add frozen fruit rather than ice cubes for example. 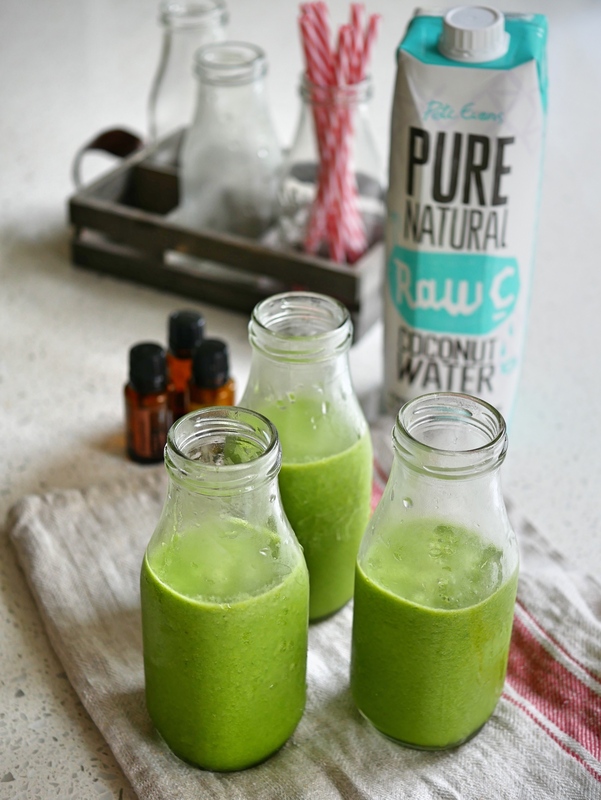 You get the texture and chill factor of a good green smoothie without, again, diluting the taste down with ice, though ice is of course totally acceptable. I think even frozen avocado cubes work really well, as does frozen cauliflower, both of which have no sugar, and therefore bulk up the smoothie, with less natural sugars. BUT, in general, bananas of course work well for sugars and texture. 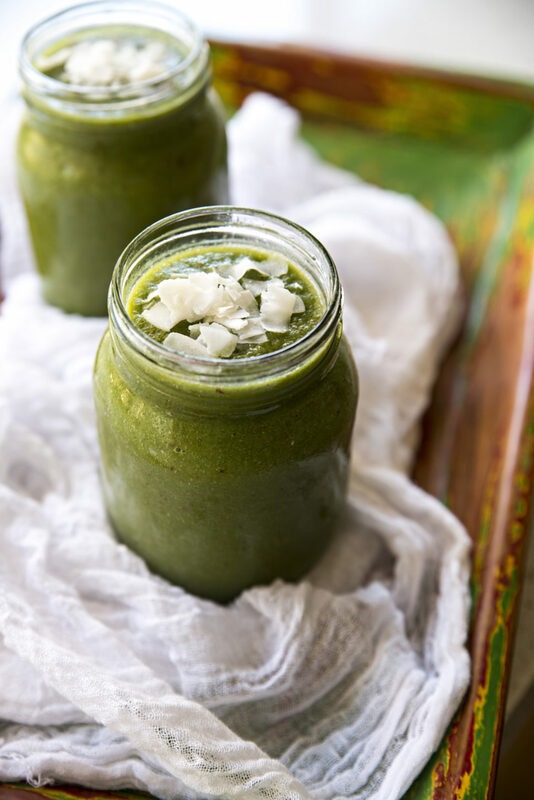 A purely greens based smoothie with no sweetener will be a bit of a challenge to your palate. It certainly is to mine, so banana's are common in my recipes. You can also freeze orange, lemon or lime juice, or even carrot juice is very sweet too. Think blueberries, or other berries, pineapple, peaches, mangoes. Basically freeze (in pieces) whatever you have in abundance and even make up smoothie bags of a mixture for your easy stress free smoothies in the morning! Fat coats your tongue and taste buds and helps you taste things longer...ergo, you should have healthy fats in your smoothies. Think yoghurts, coconut cream or oil, cacao butter, avocado, seeds or nuts, nut butters, or even EVOO, all of which will give you a smooth mouth feel and help you taste the goodness longer! You know one of my favourite things is Heilala vanilla bean paste and I struggle to write any dessert recipe without using it...and my smoothies are no exception. Get on that Vanilla train! Then there is the addition of salt. Always Murray River pink salt flakes, which have some nutritional integrity as well as being pure as the driven snow. Salt will help bring out the natural sweetness of the other ingredients and bring a balance to the overall smoothie. You can also add other sweeteners of choice if the sweet fruit thing isn't enough for you. Think fresh dates, pure maple syrup, honey, coconut sugar. I make no secret of being in love with the Doterra essential oils and I encourage you to have a look into the other benefits of using oils in your life. For flavour there is literally nothing that can make such a huge impact with so little. I love so many of the foodie oils I can't list them all here. Needless to say, go and have a look HERE and then by all means have a chat with me. For your smoothies though, think, peppermint or spearmint, wild orange, cinnamon bark, black pepper, turmeric, ginger, all of which will not only add some flavour, but have other health benefits as well. I saved the biggest point till last. YEP...blending. No matter which machine you use to make your green smoothies, don't underestimate over blending! There is nothing worse than drinking a green smoothie (smoothie is the operative word here) and choking on some substance that you wish you hadn't. 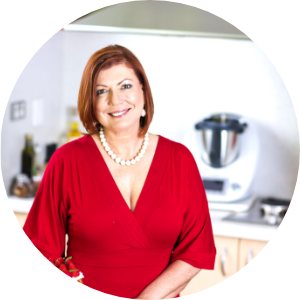 So go wild, if using a Thermomix, go for at least 2 minutes. That is AGES in Thermo-land, so if you are using a Nutri-bullet or other food processor, think about doubling that time at least. You will thank me for it. Garnish at will. It just makes it so easy to have something wonderful and good for you if it's pretty. (It is good for you, and if you follow my tips, you will love it anyway, but let's get all instagrammy and make it pretty too!) SO think shredded coconut or coconut chips, cacao nibs, blueberries, strawberries, mint leaves, stick of celery, chia or other seeds (in the shape of a heart please!!) sliced cucumber, lime wedges, stripey straws, wedge of pineapple or mango. Oh and of course, a green smoothie is a whole lot better for you if served in a mason jar. Just saying.